When you flush your toilet and the water starts to rise and seeps over the toilet bowl, your feeling of panic may be overwhelming as water floods your bathroom. If you’ve been having trouble with your toilet, Michael & Son Charlotte can take care of your problem without delay! There are many signs that your toilet may be in need of service or replacement; however, many toilets are in need of service without any obvious signs. A larger than normal water bill may be attributed to a washing machine or dishwasher, when a leaking toilet is actually the most common reason why a water bill has skyrocketed. Toilet repair in Charlotte is usually much more affordable than dealing with an outrageous water bill. Our plumbing professionals can provide toilet repair quickly and efficiently by assessing the situation and recommending a solution that works for your home or business. If these solutions do not seem to fix the problem, contact our plumbers to repair your toilet. You may even need toilet replacement in Charlotte. We’re currently offering $75 off any toilet replacement, saving you even more money off of our already affordable prices. We can help you understand the benefits of a new toilet, including water savings and tax rebates and credits for high efficiency appliances and systems. Contact us today to learn more about the toilet replacement in Charlotte that we offer. For more information about toilet replacement, repairs, and installation in the Charlotte area, contact the professionals at Michael & Son Charlotte for fast, dependable service at affordable prices. 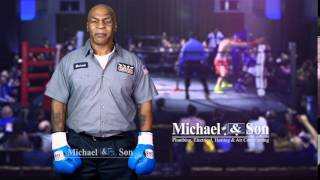 Call Michael & Son Charlotte for high-quality sewer and water line repair and replacement services. Ask us about our special offers! We proudly serve Charlotte, Gastonia, Salisbury, Concord, and Matthews NC, and Rock Hill SC.